My scheduled day off from work today aligned with the unseasonably warm weather we’ve had in the past week, so I decided it was a perfect time to head out on the Salsa Fargo for my first “big” ride of the new year. The forecast called for it to break 50 degrees; I don’t think it got that warm, only around the mid- to upper-40s, but it was sunny, and with the right combination of clothing, I had a pleasant and comfortable ride. 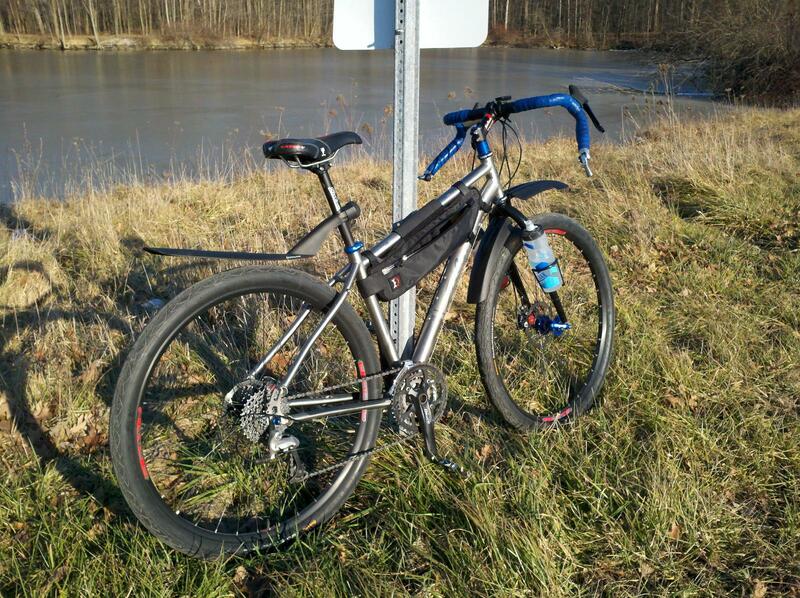 I headed out towards Aurora to pick up one of my favorite routes, Pioneer Trail to Garrettsville. There was still a thin glaze of ice on the surface of Aurora Lake. I had recently stripped the Fargo out of full touring mode, removing the fenders and racks to start experimenting with “light ‘n fast” touring setups. I wanted to keep the road spray off, though, so I threw on some clip-on fenders–the Headland BackSlide on the seatpost, and the Topeak Defender FX up front. The roads were all but bone dry, though, so I would have been fine without the fenders today. This was my first time trying out my new Revelate Designs Tangle Frame Bag. My size medium Fargo frame required the Small size Tangle bag, but the bag still doesn’t leave room for bottle cages on the down tube or seat tube. Fortunately, the bottle cage mounts on the Fargo fork took up the slack. The Tangle bag worked great doing double-duty, taking the place of both my seat bag and my handlebar bag. I was able to fit all of the usual items–spare tube, tire levers, patch kit, multi-tool (all from the seat bag), plus wallet and mobile phone. I also squeezed in a pair of wool liner gloves, in case it warmed up enough that the heavier fleece gloves that I started out with became too much. I stopped into Miller’s Family Restaurant in Garrettsville and dispatched their stuffed pancake special, along with a fine cup of diner-caliber coffee. I headed straight back west on State Route 82 to Hiram, and continued out of Hiram. I originally planned to stay on Route 82 all the way back to Twinsburg, but as I got to the edge of Hiram, I passed up Alpha Road on my right. I had recalled passing by this road many times, both by bike and by car, but had never been on it, so I decided to check it out. The pavement was a slightly rough chip and seal surface, but the fat tires on the Fargo made that no problem. There was a slight climb at the start, and then I was rewarded with a long, straight descent before the road ended in the village of Hiram Rapids. A left turn onto Winchell Road put me on course back towards Aurora. I’ll have to keep this little connector road in mind when putting together future routes. I tried another recently-acquired product today. I had been searching for a good pair of winter commuting pants. I usually wear a pair of wool tights (SmartWool) under a pair of Endura Gridlock waterproof pants. This works great when it’s raining or otherwise really nasty, but any waterproof overpants tend to make me overheat and feel a little too clammy on those dry and cold-but-not-too-cold days. Plus I wanted some kind of one-piece system for my legs, something lower maintenance and easier to get on and off than a two-layer system. I figured a pant made out of a softshell material would fit the bill. The softshell would give warmth and enough water resistance during snow and light rains. I know it won’t keep me dry in a full-on downpour, but what does? I was intrigued by the Showers Pass Hybrid Zip-Off Pants, but decided against them, although I foresee them being added to my cycling wardrobe some time in the future. I finally settled on the Pearl Izumi Infinity Softshell Pants. These are actually a running tight, with a more loose fit compared to a cycling tight, which is what I wanted, to give me a more casual look for errands and coffee stops during commutes, plus provide the quicker and easier on-off that I was looking for. These running tights provide another feature not typically found on cycling tights, namely pockets, which I wanted for quick access to items such as keys and lip balm. The Infinity pants have two full-size hand pockets on the sides, with zippers for security, and a small zippered key pocket on the middle of the back. The leg openings have a full cut, but there are snaps on the sides to cinch them down to minimize flapping while running, or in my case, to keep them out of my chainrings. I bought the pants in a Large size, which probably have more room than I need; I probably could have gotten away with a Medium, but I wanted to make sure the pants had enough length to still give me full ankle coverage while in the saddle. They aren’t too large; the drawstring waist keeps them hiked up securely. When they arrived in the mail at work, I tried them on immediately, and one of my co-workers remarked that they look like they’d make great comfortable lounge pants, which I think they would. The Infinity pants worked great over the course of the 49.5-mile ride today. That says a lot, given that many non-cycling clothing items feel fine during short commutes and errand rides, but don’t hold up their comfort level over the course of a long “serious” ride. Even though the pants have a seam through the middle of the crotch, with my regular cycling shorts underneath, the seam didn’t have any negative impact on that sensitive area. My only complaint about the Pearl Izumi Infinity Softshell pants are that they were a little too warm for today’s conditions, but that’s a good thing. I won’t dare to complain about today’s spring-like weather, and I bought the pants with the intention of wearing them in colder weather, say, 40 degrees and lower.